Planning to leave the hustle of everyday life or just a short weekend getaway has never been easier. Short term rentals allow you to rest and unwind without requiring too much planning ahead of schedule. Technology is aiding how travelers book stays in a new city and that is what has propelled the growth of this industry. What are Short-term Rentals (STR)? Let’s begin with what constitutes a Short-term rental. A short-term rental, or vacation rental, is the renting of a furnished home, an apartment or condo for a short stay, generally less than 3 months. The owner usually rents out the property on a weekly basis, but some short-term rentals offer nightly rates as well. The owner rents out space within his property that he may not be using. Some vacation rentals can be shared spaces as well, especially during peak season such as New Year’s when the rent is likely to be higher. It is becoming increasingly common for people traveling to a new city for music festivals or sports events to rent houses or condos instead of paying expensive hotel rates. Short term rentals are far more advantageous for owners. The flexibility offered with renting the space for a short time and getting higher prices especially around holidays or festivals makes them more lucrative than fixed long-term rentals. In some countries, there are tax breaks for short-term rentals as the income generated need not be mentioned as rental income. Airbnb is the biggest success story in this space. The company has alone scaled to over 4 million properties in over 65,000 cities across the world. Airbnb now has a presence in over 191 countries and it has been able to do that in a short term of just 10 years. Just to bring this into perspective, the company is now valued at over $31 billion which is 30% more than the nearest rival, the Hilton Group of Hotels. Thanks to a de-centralized platform, customer-centric services, the short-term rental space is growing at an unprecedented rate. It is forecasted that the industry would add $56 billion in the next 3 years to reach a whopping $194 billion in market capitalization by 2021. So why are people choosing Airbnb over hotels? There are three simple reasons, low cost, convenient location and household amenities. According to a report from the Ryerson University, people are also motivated by the authentic, local experience apart from the above-mentioned factors. Another fair point is flexibility. With hotels, you are tied to their check-in and check-out timings. Airbnb hosts offer far more flexibility and in my stays, I have found them to work with my schedule. Just imagine checking in at 8:00 in the morning, taking a shower and being ready to go out before the sun takes over. Then there’s the space. Most Airbnb rentals are entire homes or condos, with some shared spaces as well. You get the entire house all to yourself and there are far fewer restrictions on how many people you can have in the space. Coming to amenities, an entire kitchen at your disposal can be a godsend and a huge money saver. Then most also have a washer and dryer in place, another huge money saver. You really don’t want to take a huge load of dirty laundry back from your holiday? According to a report for PwC, it is estimated that about 20% of Americans have participated in some type of shared economic activity. This is what has fueled the sharing economy to grow to $335 billion by 2025 covering sectors like travel, car sharing, finance, staffing, and streaming. Millennials and the Gen-Z aren’t really concerned with home-ownership. The younger generation doesn’t want to remain planted in a city. Their studies or jobs may take them away for months or years at a time, which demands them to have fewer belongings. This is where the sharing economy comes in. This represents a tidal shift from home-ownership to rental investments. Short term rentals are also great value for money, especially for groups. The average per night cost of an entire 3BHK home on Airbnb is about $200. In comparison, you would get just a single room at a five-star Hotel which can accommodate a maximum of 3 people. This makes the short-term rental far for functional, spacious, with better amenities compared to a similarly priced hotel. Another driver of growth is tech platforms such as Airbnb, which are making it easier than ever to find renters. As a property owner, you should be looking into diversifying your investments with short-term rentals. 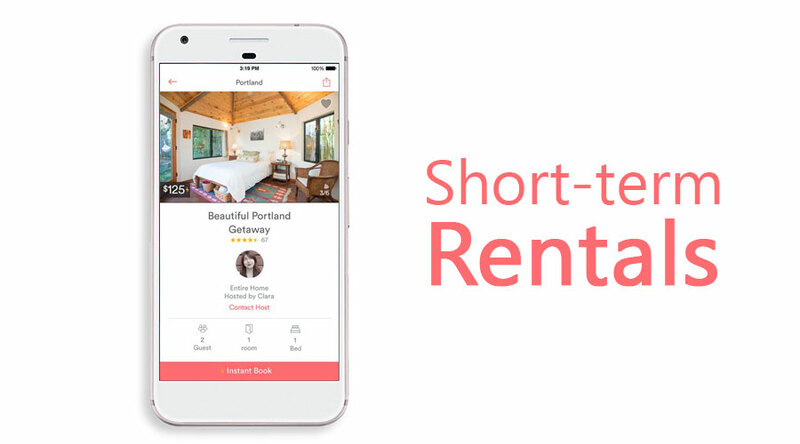 Revenue from short-term rentals can easily cover the mortgage on the property and help first-time real-estate investors get into the market. Technology is re-shaping the real-estate market and short-term rentals are on the cusp of another significant boom in the space. STRs are far more lucrative for owners than long-term rentals, great for customers and easier to get into for novice investors. This is why the biggest real estate investment platforms, like SmartOwner, Asia’s leading property marketplace, are now introducing investment opportunities in short-term rental portfolios. Revolutionary offerings like the SmartOwner STR Series are transforming real estate investments and letting individual investors own a stake in a portfolio of properties in the hottest destinations and fastest growing regions of the world. Traditional real estate investing has reached an end. Discerning investors who can recognize the transformational change in the real estate industry will want to get in on the ground floor of the future of real estate and participate in the most exclusive international hospitality portfolios available for individual investors. STR properties within these portfolios generate superior income and give investors best-in-class quarterly returns. The fact that they are professionally managed by domain experts gives them a huge advantage in rent-generating capacity through best practices like dynamic algorithmic pricing, superior services, and revenue optimization.